The product comes out lightly grayish but has color capsules in it. When you are blending the product into your skin it will start matching your skin tone. This product only comes in one shade and of course according to Lioele it will match everyone. Sheet masks is an easy way to really deep moisturize my skin and i love how my skin feels after using these masks. I use a lot of different masks and not always with snail mucus. There are a huge variety of masks out there and there will be a whole topic on sheet masks soon. 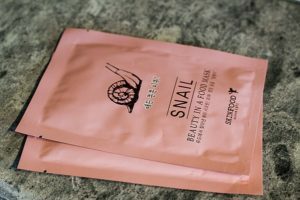 This sheet masks contains snail mucus or extract if that sounds better, works great for aging and damaged skin. I really like this product but somehow I tend to forget about it. When I do remember it and use it I always feel surprised that I don’t use it more often. I often use it as a setting spray. The fragrance is really refreshing and I really like the smell of it. The spray comes out really fine, don’t keep it too close to your face, about 20 cm is fine. I have the colors of Azaleas and Rose and I simply love them both and I will buy every shade that comes out. They also come in a balm version which I have not tried yet, but definitely will. 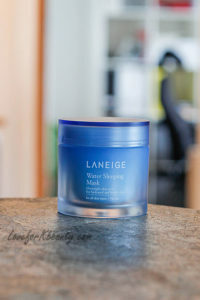 This is a Holy grail to a lot of people and it is actually the bestselling product of the brand Laneige. Before I bought this I read a lot of reviews on the product and there were not many who had any negative things to say so of course I had to try it out. It comes in a jar, which feels quite nice and it also comes with a spatula for hygienic reasons. It has a light blue color and the consistency is a mix between a gel and a cream.